Are you and a group of friends or family planning on taking an exciting, adventurous camping trip in the near future? Are you apprehensive about lugging around several bulky tents, in order to ensure that all the travelers in your group have a place to sleep? If so, large tents are the perfect choice for you. Replacing the numerous, low-quality tents with one of our best large tents can increase efficiency and comfort for any large camping group. 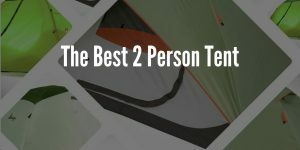 What type of campers would best benefit from switching over to large tents? There are many different groups who would find the switch quite advantageous. First is the large traveling family or friends who find themselves returning to campgrounds for every gathering. No longer are the days of stuffing your car with the multiple tents in order to accommodate your large group. With large tents, you can enjoy the extra space to haul other necessities for your trip, while resting assured that the entire group will have a comfortable sleep, allowing all to restore their energy in order to enjoy the next day! Another group who would greatly benefit from using large tents are those who value space and comfort. If you are tired of being cramped into a small tent and feel like you can never get adequate sleep on camping trips, making the switch to large tents will serve you well. Extremely spacious. Never again will you have to fret over how to fit everyone and everything into your tent! Cost-Effective. Purchasing one large tent saves much more money than if you were to purchase several small ones. Large tents almost always come with room dividers, giving you a chance to relax in solitude. Space-Saver. Choosing to go with one large tent rather than several smaller ones saves space both on the way and at your final destination. 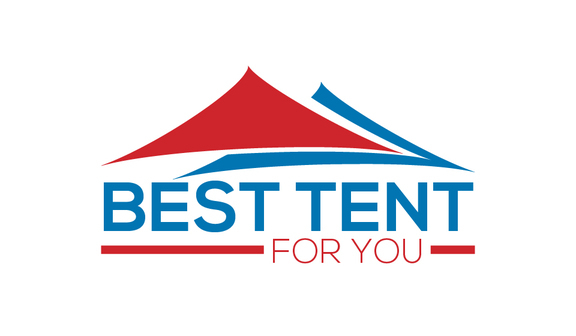 Although replacing several small tents with one large tent may save you money in the long run, purchasing several large tents could become a costly endeavor. Large Size. Once again, if you are looking into purchasing several large tents instead of just one, their tremendous size could be a hassle at times. The Coleman Prairie Breeze 9-Person Tent is a large tent that would amaze any of its users. This spacious, modern tent can house up to nine people quite comfortably or can be used by a smaller group that is looking for a more spread-out sleeping plan while on their camping trip. This tent works wonders when it comes to being in the midst of nature and its unpredictable whims. Rain or shine, this tent works wonders. It is build to be sturdy and stand up to even the most powerful storms. Along with its strength against downturns in the weather, it also protects against water leakage. This Coleman Prairie Breeze is built to be waterproof, so there is no need to cancel your camping plans if there happens to be a drizzle on the weather forecast. On the other hand, if the weather gets too humid and the sun is relentlessly beating down on you, and you just need somewhere to cool off, this tent provides that too! 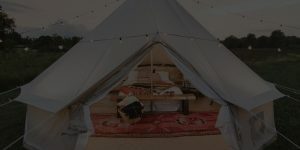 This awe-inspiring tent comes with a fan system that helps protect you from the beating heat, allowing you to enjoy your stay in the wilderness for longer. You must no longer worry about planning your camping trip around those hot summer days. This simple, sleek, and comfortable large tent is one you don’t want to miss out on. Along with its functional pros, its modern gray and black design is one that will catch any passerby’s attention. It will help make your camping trip one to remember! The Core 12-Person Instant Cabin Tent is a massive tent perfect for a large group. Don’t let its size intimidate you, though. This magnificent tent only takes around two minutes to set up! We know, we didn’t believe it at first either, but it’s true. 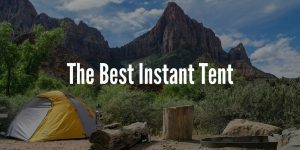 The quick set-up time allows for the most efficient use of your time; no need to worry about wasting time setting up the tent while you could be enjoying hiking or swimming in the lake. This tent aims to use every square inch of space in order to take advantage of its handy roominess. Not only does it easily sleep twelve people, it also includes many functional little quirks. For example, you have quick access to any electrical port via the electrical access port, or if you are looking for that added privacy, there are room dividers that split the large tent into three separate, cozy rooms. This tent is all-around impressive. From the quick set-up time, to the mere size, to the added amenities that aren’t present in many other tents, this large tent is worth every penny. To add to its functional advantages, this large tent is also pleasing to the eye. Its simple, symmetrical façade and electric green color make it a tent like no other. All in all, this tent provides every possible feature that any large camping group could conjure up. For anyone who wants to have an unforgettable camping experience, this Core 12-Person Instant Cabin Tent is the best large tent for you! Enormous is an understatement when it comes to describing the size of the Ozark Trail Base Camp 14-Person Cabin Tent. This cross-shaped tent has four protruding compartments, making it the perfect tent for a colossal group who would like some alone time, or at the least, a little separation from being with the entirety of a large group at once. This large tent can hold up to fourteen people with ease, and for any group smaller than fourteen people, this tent would be an extremely roomy luxury! This tent facilitates movement among its inhabitants in the separate compartments by including four entries and exits through which each specific section has easy access to the outside. Along with this, there is another even greater feature. For those of you who love to look at the clouds during the day or stargaze during a clear night or just like to have sufficient ventilation, there are twelve large windows spread out across the span of this impressive tent! What more could a passionate camper and outdoorsman ask for? To add to the practical features of this large tent, its appearance will also satisfy every user. The earthy tan and blue of the body compliment the surrounding nature and add to the enjoyable camping experience. For groups of campers that approach a count of fourteen persons or simply want a comfortable, spread out place to lounge during your activity-filled camping trip, this tent is the tent you have been waiting for. The Core 9-Person Extended Home Tent is the ideal tent for campers coming in groups of around nine people. This spacious tent even has room for most individuals to stand up straight in. This large tent begs the attention of all, especially those campers who value organization and order. This Core 9-Person tent comes with a handy gear loft that includes organization pockets- to hold your belongings off of the floor- as well as a lantern hook. Furthermore, the set-up for this tent is easy and quick, allowing you to begin your camping activities almost as soon as you hit the grounds! Rain? Wind? Bolstering heat? No problem! This tent is equipped with gadgets to protect you, even when Mother Nature throws the worst at you. Its waterproof, sturdy build allows you to continue on your camping trip worry-free, even when rain and winds are in the forecast. 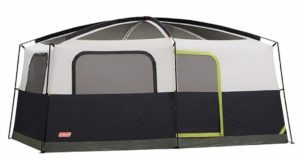 On the other hand, this tent is also perfect for when the heat may be too much to handle; it comes with an advanced venting system that will ensure coolness on the inside. Aside from its practical functions, this tent’s appearance is one to remember. 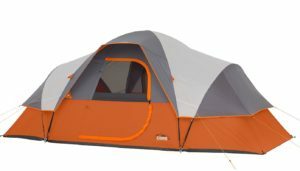 The electric orange contrasted with the gray top make this tent an appealing spectacle to look at. Considering its handy functions and amenities, plus its capturing façade, it would be a shame to miss out on the Core 9-Person Extended Dome Tent! 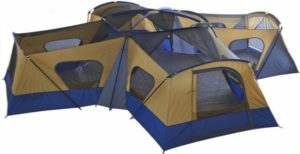 Lastly, but certainly not the least, we have the Ozark Trail 10-Person 3-Room XL Family Cabin Tent. This gigantic tent is sure to amaze any camper, old or new, and can fit up to ten people in its three large rooms. No need to fret about whether you will have enough privacy or not, since this tent comes with three separate doors, giving each separate room added privacy and mobility. This tent also holds up very well to whatever weather may bustle its way. The tent is made of a water-resistant material that will help keep all campers and belongings dry in even the heaviest rains- no leaks in this tent! 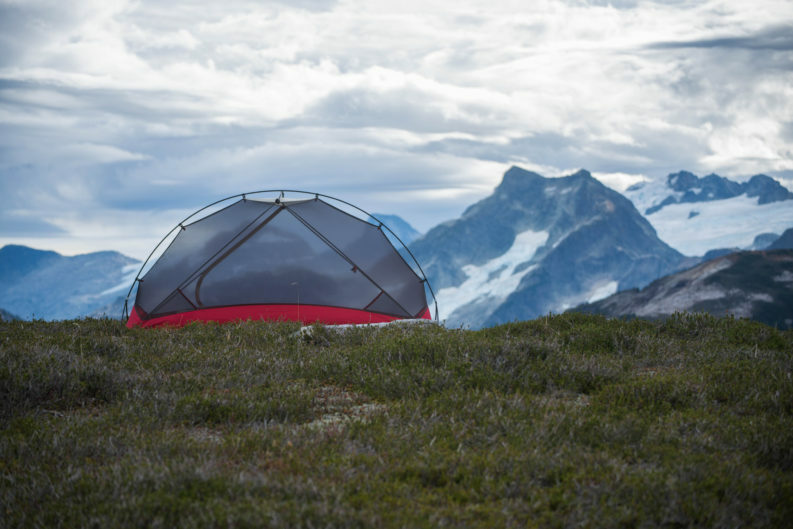 To top that, this tent works equally as well in hot weather, thanks to its intricate venting system, which doubly acts as a great provider of 360° views when lounging inside of this comfortable tent. We’ve looked at the numerous technical advantages of this magnificent tent, but that’s surely not all that it has to offer. Its eye-catching appearance is perfect for those campers who like to stick with more down-to-earth hues. The dark maroon and gray provide an elegant and natural look that everyone will love! 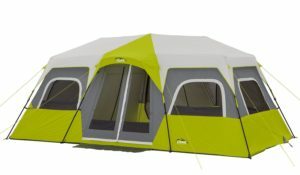 The Ozark Trail 10-Person 3-Room XL Family Cabin Tent has a plethora of impressive features and is one of the best tents for groups of ten people who look to enjoy their next camping trip. Trust me, you won’t want to miss out on this one! Personally, one of the above tents stands out to me in a way that the others do not, and that tent is the CORE 12-Person Instant Cabin Tent. 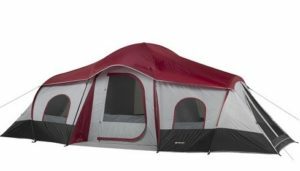 Not only does this tent have an impressively quick set-up time, at only two minutes (which means extra time for swimming and hiking), but its monstrous size is great for when I travel with a large group of family or friends. This 18′ x 10′ x 80′ tent can sleep up to twelve people without cramming, fit up to three queen air mattresses, and be split up into three private rooms, all for quite a reasonable price that doesn’t put a hole in my wallet. To add to that, this tent also comes equipped with a great venting system, which along with keeping me cool at night and during those relentlessly hot summer days, gives me access to a breathtaking panoramic view of the beautiful nature around me. This tent has made my numerous camping experiences ones to remember! Don’t think a large tent is the right fit for your camping endeavors? No problem. There is one alternative to buying a large tent: purchase several smaller tents. Even though this may be harder to transport, set up, and pay for at times, this is still a good alternative for those groups of campers who find themselves with around nine or more people. You could choose from any combination of a 2, 4, 6 person tent , or 8 person tent, which gives you the added power of a more specific fit for the particular size of your group. Although this may have some disadvantages in comparison to using a large tent, it is still completely possible! For campers who enjoy taking trips with large groups- whether that large group be family or friends- switching over to large tents is a great idea! The added size, amenities, and efficiency allow you to have a less stressful camping trip. They provide ample space for rest and sleep, which means more energy to take part in the diverse array of camping activities. No need to worry about tossing and turning or being crammed in a tight space with little ventilation. There is a wide variety of large tents- such as the top five mentioned above- that you can choose from. Start your search today!